In 1684 Mathias Klotz brought the craft from Italy to his home town in Bavaria. This was the beginning of a centuries-old tradition. The violin-making school was established 200 years later. Students from all over the world still come to Upper Bavaria today to learn the beautiful craft. Around a dozen master violin makers are active in Mittenwald and their pieces are highly desired in the music world. The work of their colleagues from the 19th century can be admired at the Mittenwald Violin-Making Museum. Since 1930, it has been drawing visitors into the world of the music and has over two hundred stringed and plucked instruments on display. All you need to know on the subject of „violin-making in Mittenwald“ can be found in the illustrated book “Geigenbau in Mittenwald”. Over 100 vivid color photographs and informative articles tell a lot about the development of this unique and historic craft. Which community would be more suited for hosting this competition than Mittenwald where an over 300 year old tradition of making violins and plucked string instruments exists? 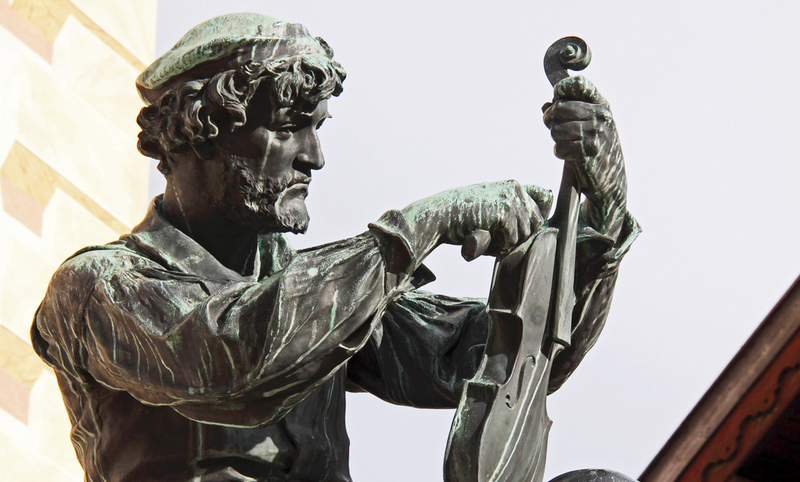 Everything began in 1684, when Mittenwalds famous son Matthias Klotz returned from Italy to his home town and brought back with him the knowledge of the high artistry of violin making. Since those days stringed instruments have been built in Mittenwald incessantly. In order to preserve the development over the centuries for posterity the Violin Making Museum of Mittenwald was established in 1930. Many generations of pupils from all over the world have passed through the 1858 established Violin Making school and there they receive an excellent specialised apprenticeship. Therefore Violin Making and Mittenwald are two terms which are inevitably linked together. The Violin Making Competition in Mittenwald was held for the first time in 1989 and since then it has gained increasing popularity and appreciation. In 2005 more than 200 participants from 25 nations took part in the competition. The instruments and bows which won can be viewed on the left hand side. The last competition took place in 2010.